Center Camp is the central hub for Apogaea. Here you can learn more about the Ten Principles, grab a piping hot cup of coffee, purchase ice, sit back and groove to some live music, participate in a workshop, or just mingle with fellow Apogaeans. If you find yourself yearning for a tasty hot beverage, coffee (caffeinated or decaf), tea, etc., Center Camp Cafe will be serving around 8 a.m. to around 8 p.m. Thursday through Saturday.There is no cost for this, so be sure to thank your friendly cafe volunteer! Donations still needed! Center Camp Cafe relies on coffee and tea donations from the community. If you have some you’d like to contribute, bring it to the cafe during those hours and you will surely be rewarded with good karma! If you would like your coffee cooled or iced, please bring your own ice or purchase a bag for center camp to serve your fellow participants. As always, practice self-reliance and BRING YOUR OWN CUP! »Learn what you can donate to Center Camp! Suggested donation: $3 per bag – bring exact change. Feel free to donate more. Ice comes out of the big ice chests, donation goes in the igloo! It’s that simple! Please use only what you need. We do not yet know if there will be one ice delivery or two. 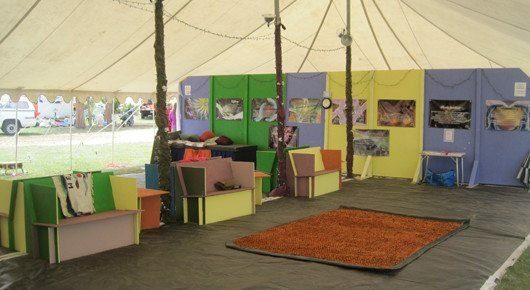 The wonderful performance space put together at Center Camp this year will be in operation from about 10 a.m. to 10 p.m. There will be lots of amazing performances and workshops all day… come down to find out what treats are in store for you! The friendly volunteers at the Info Booth can help smooth and improve your Apogaea experience. Take a gander at the Who What Where When if you forgot to be radically self-reliant and print yours. There are actually 10 Principles of Burning Man. Yes, ten! Find about all of them at the Everywhere Booth, manned by seasoned burners and our Regional representatives. They are happy to tell you all about how to get involved in Burning Man year-round, highlighting projects such as Burners Without Borders, the Black Rock Arts Foundation and more! Come meet the board at our “Meat and Greet” Saturday from 2 p.m. to 4 p.m.